Piste off | Guten Morgen Berlin! February 23, 2014 January 11, 2015 - Guten Morgen Berlin! It is time, friends, for us to take a holiday from Berlin life; from the dogs, the shouting squatters and the early-morning beer drinkers. For a quiet moment let us leave this strange and alien world and retire to the Alps, a rural existence in the white, snowy peaks. Let us dump our baggage in a cosy hotel room and free our minds. And then, let us strap large, sharp planks to our legs and go outside and slide around on the mountainside. No culture could be more weird, more confusing or more fascinating than the world of Austrian skiing. I myself am not a natural skier. My parents have been avid skiers since long before my birth and my disgustingly cool brother learnt on a series of posh school ski trips which culminated in him learning trick skiing and thus becoming so blindingly cool you have to wear solar-eclipse sunglasses to make eye contact with him. Meanwhile, I solidly asserted year after year that nothing could be more dangerous or less fun than me, an unathletic heap of dough, speeding wildly around on a steep slope with two large knives attached to my feet. Finally I was persuaded that it might be fun and grudgingly let myself be dragged to Switzerland in my late teens. After three days of drab ski lessons with a leather-faced instructor, who taught us to creep down a slight incline with our knees together and feet apart like Elvis with a bladder infection, I decided to take matters into my own hands and developed my own skiing style, which involves crouching with legs wide apart like an aggressive crab. Once I had mastered this I actually learned to control my speed and direction, and soon realised that it was actually quite fun and a gloriously mad way to spend a week’s holiday. Many of you will never have been skiing before, so I will begin with the basics. Skiing is a kind of game in which you straitjacket your feet into rigid plastic boots so tight and unyielding that you can feel the blood pulsing through your calf muscles – if you do not tighten the boots to the maximum healthy limit (i.e. where you are unable to move or even feel any of the parts of your leg below the knee) you will not be able to control the skis properly. With the skis attached this feels ok – your lower legs transform into strong snow-spreading apparatus – but without the skis these boots make you walk like an elderly cowboy at a quarter of your usual speed. Also, after a day and a half, they feel like fiery agony. It also pays to do a bit of strength training before your skiing holiday because the majority of each day involves squatting with half-bent legs while your thighs tense and ripple with the effort of keeping your balance and, most importantly, not letting you plummet down the mountain at a gazillion miles per hour. It is advisable to also train your arms, as there will be almost as many moments where you unexpectedly come to a slow halt on a long, flat surface, and realise that you have to drag your entire self along using nothing but your two sticks until you reach another slopey bit where you can resume your pastime of trying to avoid a warp-speed death. Pistes are divided into three categories: blue, red and black. 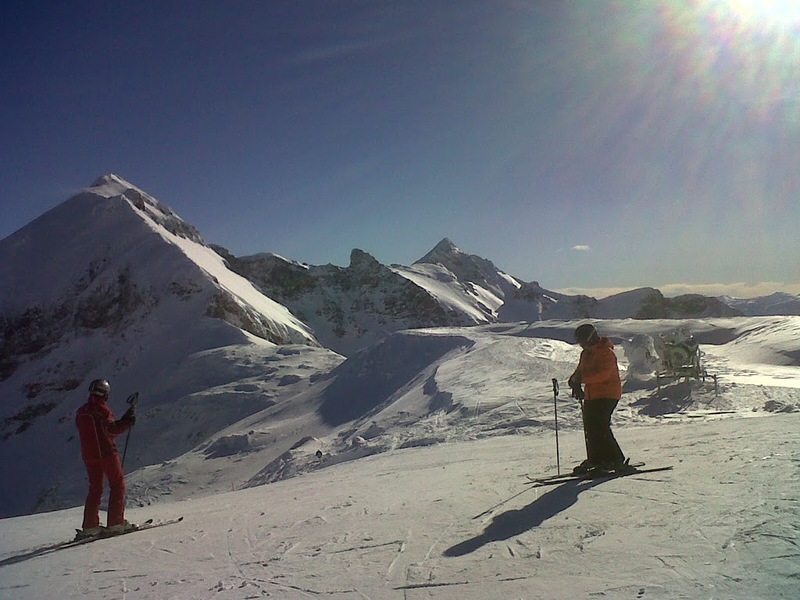 Blue are the easy pistes, with gentle slopes and smooth curves, suitable for everyone from beginners to old-timers. Black pistes are the very difficult pistes; they are usually steep-going-on-vertical, composed mostly of solid ice, and/or feature terrifying hair’s-breadth bottlenecks where a single wrong move will send you soaring over a cliff’s edge and into the abyss. Red pistes encompass anything from laughably easy to ‘hope you made a will’ scary. They may or may not contain a selection of any or all of the following: beautiful, fun parts, exciting but manageable; giant floury humps of snow the size of a beached walrus; face-tighteningly steep bits; long, flat bits that you inevitably come to a grinding halt on; lovely winding curves with perfect soft snow; icy slopes which make you accelerate to 250 miles an hour in three seconds; UPHILL (why? ); hidden trapdoors; assassins; misc. To get to the top of a piste, you need to take a lift. There are four different kinds of ski lift: the gondola, the chairlift, the button lift and the T-bar. The gondola is a large cubicle suspended on a revolving cable, taking you up long distances without the wind freezing your eyeballs. To get onto a gondola, you must first remove your skis, place your skis and poles into the cabin of the gondola, fall over, drop one of your gloves under the platform, get up, and then realise that the cabin with your skis in is now already halfway up the mountain. The chairlift is…well, a chairlift. You stand in a line with a few other skiiers waiting for the chairs to gently scoop you up from behind, or slam you in the back of the legs and shatter your knees to a gritty powder, depending on the speed of the chairlift. Then you lower the safety bar, which prevents you from falling out. At the same time, all skiiers and snowboarders must place their skis or snowboards onto the footrests, making sure to tangle them up and accidentally hurt each other in the process as much as possible. At the other end, the safety bar is raised and you all immediately slide out of the chairs and fall into one heap of people all snagged on each other. The button lift is a small plastic round seat attached to a pole. You take the seat and slot it in between your legs, then lean back and allow the cable to drag you up the slope with the help of your skis. It is important that you always pretend you are waterskiing at this point. The T-bar is similar to a button-lift but designed for two people. Some, like the experimental man I recently encountered one day in Obertauern, think that it might be possible for three people to ride a T-bar. This is not the case; he lined himself up behind me as if he was going to hold on to my shoulders to go up the mountain, and as soon as my mother and I realised and started asking him what the heck he was doing, one of the T-bars swung round and smacked him (and then us) in the head. He fell over halfways and was immediately hit on the head with another T-bar as soon as he got upright again. Unaware of what the problem was, he took his position behind us once more, as if it simply hadn’t gone right the first time. Everyone was falling over and trying desperately to figure out why this was happening. The whole time he was chortling away, but sadly I and the rest of the queue were forced to scream at him to get out of the bloody way until he actually got out of the bloody way. At any rate: A T-bar is a pole with a horizontal bar at the bottom, which you take and hook underneath the bum of each of the people riding it up the slope. You then both hope to hell that each of you is balanced and paying attention for the whole journey because any slight deviation from the straight path results in you both sliding off the bar and down the mountainside in a horrible backwards fashion. One T-bar in Obergurgl drags you up a 60 degree slope past row upon row of avalanche stoppers while your thighs tremble with fear and agony at trying to stay on the damn lift, because you know that if you fall off this one, you won’t be skiing (or even walking) any time soon. Once you are at the top of your piste, all you need to do is smoothly and calmly enjoy the ride back down the slope along the route of the piste. Each piste is marked with coloured poles along each side of the piste. Unlike the piste colours, which are blue, red and black, the pole colours are red, black and blue. On red pistes, the poles are red. On blue pistes, the poles are also sometimes red. Sometimes, however, they are blue, and sometimes they are black. They might also be black on red pistes, except for the frequent occasions on all pistes when they are orange. Using this easy colour-coding system you can quickly and effortlessly find your way along your chosen piste onto a different one that you weren’t trying to get to and which is now going to take you halfway across the country and into the Czech republic. Finally, it is time for lunch, and you can now stop, unstrap your skis, and cowboy walk into a self-service restaurant where you can place a bowl of soup, a salad, a cup of coffee and a kaiserschmarrn on a frictionless tray and pray to god that you can get it back to your table in ski boots without spilling everything everywhere. Safety is paramount; it is important to drink little alcohol at breaktimes to keep your senses sharp. There is one other option, which is to get completely trollied and joyfully plough on regardless. We saw a group of men who, at 11am – ELEVEN IN THE MORNING – staggered into a cafe and downed two beers and two flaming layered shots each, evidently planning to go straight back out there to merrily flail drunkenly down the mountainside. But when you sit down, with your delicious hot beefy soup and steaming coffee, and your cheeks are red and burning from the icy wind, and you remember all the great turns and awesome views and wild moments of speed and pretty bits through snowy trees…well, you simply have to hoover up your lunch as quickly as possible so you can get back out onto the snow and do more, more, more.